With pure comfort and simple elegance Penhaven is the perfect base from which to discover Cornwall's infinitely diverse and very special magical experience. With wonderful far reaching countryside views this detached house is exceptionally spacious and ideal for pulling together the generations of family or friends in any season. The fantastic dining area, where everyone can be seated comfortably around one vast table, is great for celebrating birthdays, anniversaries and all manner of festive feasts. You have a choice of two enormous sitting areas; one on the ground floor with stylish sofas beside the wood-burner or one on the first floor with vaulted ceiling, exposed timber beams and super countryside and distant sea views! The kitchen has all the mod cons including a huge American style fridge freezer with ice maker. For the kids there is a snug, complete with Xbox One, Nintendo Wii and a selection of books, to chill out on squashy beanbags. On the ground floor are four generously proportioned bedrooms (one en-suite) with deep mattresses and quality oak furniture along with a pristine bathroom. On the first floor is the sumptuous master bedroom with en-suite shower room and high ceilings to enhance the sense of space and openness. With a large enclosed garden there is ample space for children to play or for adults to relax. With the village shop selling a good range of beers, wines and fresh bread just across the road and a children's play park nearby makes this a great choice for families. Crackington Haven is located in an Area of Outstanding Natural Beauty and is a perfect spot for families, with a gently sloping beach in an enclosed bay that is great for rock pools when the tide is out. The Coombe Inn, a bistro cafe and family pub offers delicious food, ales and refreshments. With so many of the area's fantastic beaches and beautiful coastal villages close by, as well as the famous seaside town of Bude just eight miles away, this really is the place for a holiday by the sea whatever the time of year. 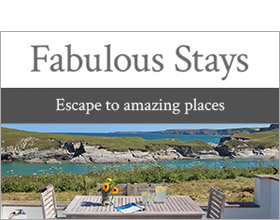 Nearby Boscastle, Port Isaac and Padstow are also highly recommended day trip destinations. Five bedrooms; 1 x king-size double with en-suite, 2 x twin 3' zip and link to super king double, 1 x bunk, 1 x king size double with en suite walk in shower, basin and WC. Bathroom with bath, separate walk in shower, basin and WC. Open plan living room with wood burner in sitting area, dining area and kitchen. Snug/games room. Utility room. Additional sitting room on first floor.